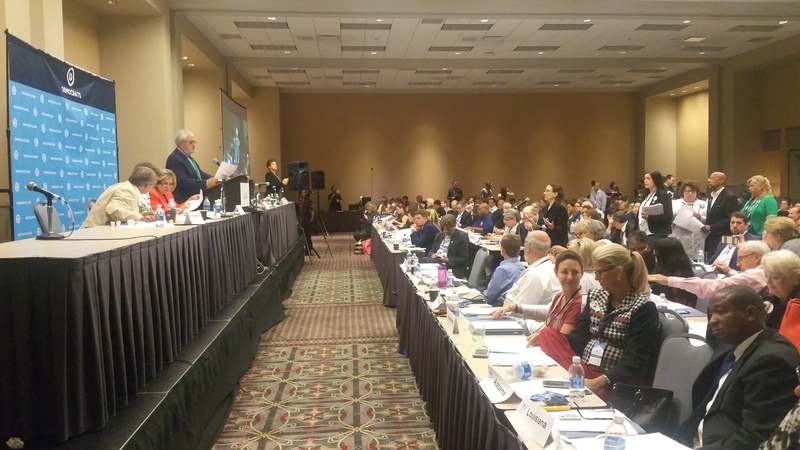 On the first day of the Democratic National Convention, the rules committee co-chairs, Barney Frank and Leticia Van de Putte, announced the creation of the Unity Reform Commission to the delegates of the convention. Van de Putte indicated that this commission “received overwhelming support from all members of the rules committee.” This was followed by glowing endorsements of the commission by Clinton delegate and DNC-appointed rules committee member Wellington Webb and Sanders delegate Diane Russell. The message portrayed to the delegates in the convention and people watching at home was that the democrats were unified under Clinton and that the superdelegates would definitely be reduced by a full 2/3 in accordance with the will of the voters. However, this glorified commercial left out important details of the commission and the process which produced it. I was one of the three rules committee members from Illinois selected to represent Bernie Sanders. At the rules committee meeting, 25 members were DNC-appointed (equivalent to the “superdelegates” of the rules committee). The rest were apportioned by state according to the presidential share of the vote. There should have been 187 total members, but some of them appeared to be missing as the total number of votes never approached this number. All proposals were submitted by Sanders-appointed rules committee members. The majority of us are lifelong democrats who wanted to improve our primary process for the future of the Democratic Party and believed strongly in the concept of one person/one vote. Many devoted a large amount of time to preparing for the rules meeting and writing proposals for various rule changes. There were about 50 proposals in all. I myself submitted 8 proposals with the help of two separate groups of dedicated delegates and activists who contributed to background research on historical rule changes and also to the writing of some of the proposals. So when I arrived the day of the rules committee meeting, I felt a real responsibility to accomplish significant change. Clinton rules committee members and DNC members did not propose any rule changes. Eliminating the superdelegates was the top issue for most of the Sanders rules committee members. We knew this proposal might not pass in the rules committee. However, if we submitted a minority report, we could have a debate and floor vote on this issue on the convention floor. We already had the signatures we needed for the minority report. It was important to do this to give this undemocratic issue a spotlight at the convention. Also, if the proposal to eliminate superdelegates passed at the convention, it would then require only a majority vote of the DNC committee (rather than the normal 2/3 vote) to amend the Charter of the Democratic Party, fully eliminating them. We wanted to fight for our delegates and our voters to have a voice. Prior to the convention, the Sanders campaign had indicated that their top goals were reforming the superdelegate system, opening up the primaries, and campaign finance reform. They had told the delegates that we would try to get these issues on the convention floor for a vote. I agreed with all of these issues and personally submitted proposals related to both superdelegate reform and opening up the primaries to include independent voters. Several rules committee members arranged a press conference prior to the rules meeting to draw attention to the proposal to eliminate the superdelegates and emphasize the broad support that this issue has among democratic voters. In addition, separate petitions were delivered to rules committee members in support of superdelegate elimination and open primaries. The meeting room was not big enough to accommodate all the democrats who wanted to observe the meeting this year. Throughout the meeting, delegates and members of the public in the gallery implored the rules committee to listen to their voters, and those who were locked out of the meeting in the hallway protested. Our first superdelegate amendment presented was to eliminate the superdelegates. This failed to pass, so we proposed a variety of compromise measures that still would have made significant strides toward a more democratic primary process. Our proposals included eliminating lobbyists, decreasing the superdelegate vote to 1/10 of a pledged delegate vote but retaining their status, superdelegates not voting until the second ballot, and only elected officials retaining their superdelegate status. Unfortunately, the Clinton and DNC-appointed members joined together to vote down each of our compromise proposals as a block, so the only members voting for any changes to the superdelegates were Sanders committee members. We had many people giving excellent arguments for eliminating or at least decreasing the superdelegates’ power. There were only a handful of people speaking in opposition. The opposition speakers included Wellington Webb from Colorado (a DNC-appointee to the rules committee, a Clinton delegate, and a co-chair of the democratic convention), Sheila Jackson Lee from Texas (a superdelegate and Clinton rules committee member who nominated Webb for the co-chair position at the beginning of the meeting), and Donna Miller from the Virgin Islands (a superdelegate for the past 8 conventions and a DNC-appointee to the rules committee). These members were also surrogates for the black caucus, who had sent a letter to the rules committee chairs indicating they would fight any attempts to decrease the superdelegates or open up the primaries. Their reasons for opposing our proposals included that “this is not the time or the place” to vote on rule changes, that eliminating the superdelegates would decrease the number of African-American delegates, that the superdelegates were not here to defend themselves so it is not fair, etc. Ironically all 3 of the main speakers were essentially superdelegates and were not only defending themselves but imposing their will as DNC-appointed members behind the scenes as well. Some of the younger Clinton members said that they themselves did not know enough, so therefore none of us were qualified to make decisions. When we corrected them that the rules meeting is exactly “the time and place” to address the rules, that pledged delegates who represent the voters have more women and minorities than superdelegates due to affirmative action requirements, and that the DNC committee would be voting on any of our amendments to the Charter after our meeting according to DNC rules, they ignored our arguments and stuck to their talking points. They kept saying any decisions should not be made here but at a later time. The problem with this argument is that the standing rules committee of the convention and the delegates of the convention (with the exception of the superdelegates) do actually represent the people. The rules committee that meets in between conventions is DNC-appointed and requires a 2/3 vote by the DNC on any amendment to the charter. If we passed a concrete rules change at this meeting and voted on it at the convention, then only a simple majority vote of the Democratic National Committee would be needed. Then Wellington Webb (DNC/Clinton) and Michaeleen Crowell (Sanders) stood up and called for a recess, which we thought would be brief so we agreed to it. Instead, it was almost 3 hours, during which the Clinton and Sanders campaigns agreed on a back room deal, leaving the vast majority of rules committee members out of the loop. When they returned to the meeting room, they told all Sanders delegates to go into a separate room. Once we were in this separate room, the Sanders campaign proceeded to tell us they had negotiated a deal with the Clinton campaign to form a commission instead of changing any rules during our meeting. They told us all that we should vote for this deal. Members asked if we could still file minority reports and we were told that we could. We were also assured that we could still present the remaining proposals that were unrelated to superdelegates to the rules committee. The Sanders campaign had submitted a proposal establishing a Commission for Democratic Integrity prior to the rules meeting that we all knew about. We also knew that they had shown their proposals to the Clinton campaign prior to the rules meeting. Those of us who had studied past commissions had been reluctant to support a commission in place of an actual rules change because they have been used in the past to kick the can to a non-election year when the rules committee and DNC would ignore most of the commission’s recommendations. But now it was worse because the Clinton campaign had changed this original commission proposal, which had some tough, enforceable language in it, to a watered down version that left out many of the original components (including incentives for open primaries, language that only required a majority vote of the DNC rather than a 2/3 vote, and restrictions on the future rules committee that they had to rule in accordance with the commission findings). Instead of a recommendation to change all unpledged (super) delegates to pledged delegates, there was now only a change to DNC committee members (about 60% of the superdelegates) and the rest remained unpledged. Also, the wording now contained loopholes so that the three different levels of committees (the commission, the DNC-appointed rules committee, and the DNC committee) that must approve these recommendations could water them down further, or in the case of the DNC committee, vote them down entirely. The commission would have a Clinton chair, a Sanders vice-chair, 7 Sanders-appointed members, 9 Clinton-appointed members, and 3 DNC-appointed members, leaving the Sanders-appointed members with a clear minority. Judging how the DNC and Clinton members had voted together in lockstep at the rules meeting, this would leave the Sanders members with very little power. The time frame would be approximately 2-3 years for the process. Nothing would happen until after the general election. They renamed it the Unity commission, and Webb was now listed as a co-author of the proposal, indicating that he had been the one in charge of watering down the original commission proposal. When we returned to the room, the Clinton and DNC-appointed members now enthusiastically voted for this commission even though none of them had voted for any of our proposed superdelegate rule changes. A few Sanders rules members voted against it, fearing it would jeopardize our other proposals or getting a floor vote on superdelegate elimination. Now it was clear that the Clinton and DNC members had been voting down all our proposals because they wanted this commission all along. Voting against our proposals gave them leverage with the Sanders campaign to compromise further on the commission and stopped the superdelegate debate. It would kick the can down the road so that grassroots Sanders members were excluded, and it would occur in a non-election year with little publicity. They wanted this commission because it would limit all debate to the rules meeting rather than the convention, virtually eliminating mainstream media coverage of the debate. It would be something to show “unity” on the convention floor where the delegates would not know the details of what they were voting on. DNC rules member Wellington Webb even said during his speech in support of the commission that it would improve the “optics” at the convention and show “unity”. Once this Unity Reform Commission proposal passed, the meeting went downhill. The Sanders campaign withdrew several proposals immediately which must have been part of the deal worked out with the Clinton campaign. The chairs argued with me about introducing my open primaries proposal, saying it was included in the commission, even though all specific open primary language had been removed from the final commission proposal. The only section that was related to open primaries was a brief sentence about encouraging same day voter registration. Throughout the meeting, the only things that the Clinton/DNC members voted in support of were minor wording changes related to LGBT issues. They continued to vote in a block against everything else, including a minor resolution asking that those of Middle Eastern descent be considered for inclusion purposes. Debate times were limited and rushed. After the meeting, we were told that we would probably not be allowed to have a floor vote on eliminating the superdelegates because the commission had been agreed to. Ten members who had originally signed the minority report for the floor vote removed their names, thinking that this was what Bernie wanted since he had agreed to this commission, and also some were intimidated by the suggestion that this was no longer allowed. Even though the vast majority of our Sanders rules committee members wanted to submit the report, we now were just shy of the number of signatures required to submit one. So the issue that many of us had worked so hard on was tabled and the delegates would no longer have a floor vote on any direct rule change. The Unity Reform Commission amounts to a campaign promise made to the democratic voters that is non-binding in terms of the end result and that will not even begin to be addressed until after the general election. It is important that we make sure these campaign promises are kept, and that there will be consequences if they are not. I am posting a copy of the Unity Reform Commission on this site because I think it is important that everyone knows the exact terms of this agreement. The onus is now on us to keep pressure on the commission and the DNC. Unfortunately, now this will require 2-3 years of monitoring, keeping track of when all the individual meetings are, and organizing press and local protesters to keep them to their word. Otherwise, it may just go the way of many previous commissions. This entry was posted on Saturday, August 13th, 2016 at 2:21 pm	and is filed under The Front Page. You can follow any responses to this entry through the RSS 2.0 feed. You can skip to the end and leave a response. Pinging is currently not allowed.